We would like to bring to your attention items about Bethlehem University that have appeared in the news recently. They have been uploaded to our website. Please follow the links below if you're interested in reading them. You can follow the latest updates on Call for Papers, and Grants and Fellowship Opportunities on the website of Dean of Research. The Dean of Students Office in cooperation with the Higher Council for Youth and Sports organized a workshop on the electronic platform for volunteering on Wednesday, 30 January 2019. The platform aims to connect volunteers with organizations or institutions in Palestine. Students can check the volunteering opportunities in organizations and institutions posted on the website that correspond with their skills. It also provides them with the needed tools and resources for enhancing their social participation. Student Counselor Ms. Salpi Giacaman and Assistant to Dean of Students Ms. Mai Jaber organized visits to 27 classes for first year students during fall 2018 and spring 2019 semesters in cooperation with the Dean of the Faculty of Arts Ms. Hanadi Younan and Br. Peter Iorlano. The visits aimed to follow up with the orientation given to them and to provide them with the needed information, tools and resources to help them in their university life in addition to answering their questions. A group of 19 students participated in the opening ceremony of the Model United Nations (MUN) program on Friday, 1 February 2019, in Ramallah. 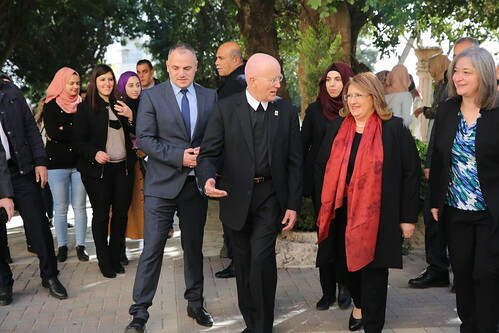 The event was organized by the Palestine Institute for Public Diplomacy in cooperation with the Dean of Students offices in the Palestinian Universities including Bethlehem University. 130 students from 5 Palestinian universities participate in the program. They will have training to prepare and provide them with the needed skills to participate in the MUN conference in June 2019. The MUN program is an academic simulation of global government bodies in which students can learn about diplomacy, international relations, and the United Nations. Ahdaf group from the Social Activations Unit in the Dean of Students Office organized a film screening of the “Room 8” film. The activity is part of the Cinema Club activities that the group organizes. Many students attended and a discussion about the film's content and idea followed. Students were also introduced to the team goals and the volunteering work they do. Different films will be screened every week. Under the supervision of the Dean of Students Office, the Progressive Student Action Front organized a celebration commemorating the eleventh anniversary of the passing of Dr. George Habash, the founder of the Arab Nationalist Movement and the Popular Front for the Liberation of Palestine, on Thursday 1 February 2019. The activity included speeches, folklore dance, and a photo exhibition. The photo exhibit contained photos of George Habash, Ghassan Kanafani, awareness about administrative detention, as well as important milestones in the history of the Palestinian cause. Published by the Communications Office for the Bethlehem University campus community on Mondays. wb@bethlehem.edu before the 12:00 p.m. Friday deadline.